Where do I use my Zest Beauty Care voucher code? Zest Beauty established in 2006 provides a premium yet affordable cosmetics range varying from Face, Body and Haircare. Renowned for their professional beauty brands and their specialism in distributing online beauty products. Zest Beauty prides itself on selling top salon brands at discounted prices such as GHD, Babyliss and L’Oreal. 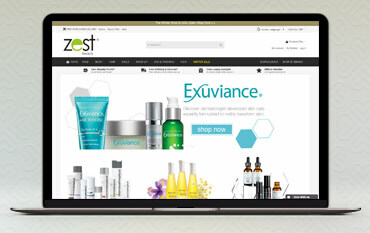 Save money shopping online using Zest Beauty discount codes. Using a discount code is a great way to save money on your order. Zest Beauty Care offers regular voucher codes. Some will give you a discount on specified items such as "10% off Moroccanoil Orders" or "10% off Sun and Tan Orders" or sometimes they offer money off all orders like "£3 off and Free Delivery on Orders Over £50 ". You just need to enter the discount code at the checkout stage to see an instant discount on your final bill. Here at Netvouchercodes, we aim to keep you updated on all of the discount codes and money saving deals that are on offer at Zest Beauty Care, so be sure to check here before placing your next order. At Zest Beauty Care you'll discover a great range of Australian Body Care products. These products contain several key active ingredients such as Tea Tree Oil, Bisabolol, Soya and macadamia. The Aborigines believed that Tea Tree Oil had magic powers and used to bathe in the lakes into which the Tea Tree leaves fell. The Australian Body Care facial products are created for all skin types and all ages and are especially beneficial for skin that is oily and prone to breakouts. The skin on your body can be especially prone to dryness and needs to be moisturised every day. Australian Body Care products are formulated to nourish and hydrate your skin. Zest Beauty also stock Australian Body Care's Hair Care products, which contain the same natural ingredients. The Zest Beauty Salon is based in West Bridgford and is one of Nottinghamshire’s best hair and beauty salons, featuring all the latest equipment in attractive, modern surroundings. Here you can relax and enjoy your choice of treatment in a comfortable and tranquil room with dimmed lighting, calming music and the aroma of essential oils. They offer Decleor, Demalogica, Elemis and Elizabeth Arden facials and body treatments, tanning, eye treatments, massage, waxing and nail treatments. You can also visit their Dermalogica Skin Bar, where you can sample Dermalogica products for free. At Zest Beauty you can find an exquisite collection of everything beauty! From Nails to face, body, makeup, hair, skincare and so much more; You can rest assured that at Zest Beauty, you will find exactly what you're looking for! Featuring an array of luxurious & popular brands including Elizabeth Arden, GHD, Dermalogica and so much more. Discover a new world of beauty and be sure to check out our page for all the latest Offers & Voucher Codes, guaranteed to make your shopping experience even cheaper!